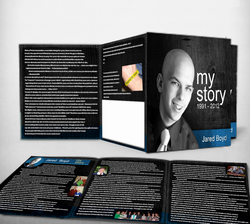 On Nov. 20, 2012, God called Jared to his heavenly home, and is now cancer free, forever! His sickness was not unto death but unto life eternal. According to the Bible, we who have chosen to trust Christ will see Jared again, some day. He prepared for eternity and would like you to do the same. Order custom or tracts with a blank field for your church or personal use.